This entry was posted in g-free recipes, giveaways, kids in the kitchen, reviews, supporters and tagged fundraising, g-free kid, giveaway, gluten free kids, kids helping, kitchen, pretzels, recipes, review, Snyder's by kachalmers2. Bookmark the permalink. Myself and my 2 kids are all gluten free and can’t wait to try the new flavors! We have been checking but no one carries them near us yet. I also totally agree on them needing to make gf pretzel rods and have been asking them from time to time for 3 years! Fingers crossed! We are excited to try these because quite simply it’s something new!! I love the idea of adding to your own chex mix! I would love to try them. I have not found snyder’s in any of our local stores. The chexmix idea would be perfect! I love pretzels and honey mustard used to be my favorite. I have never had Snyders but would love to try them. 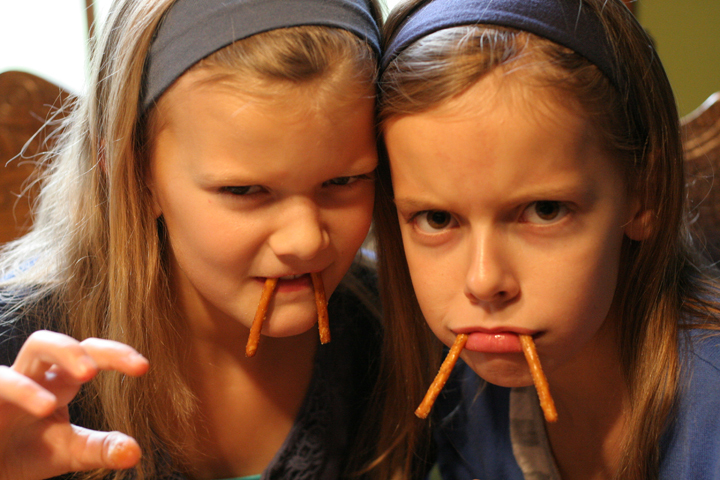 My 7-year-old daughter takes her GF Synder’s pretzels to school EVERY DAY for a snack. We keep our pantry stocked because they are her favorite school snack and she doesn’t want anything else. We haven’t seen the new flavors, but I think my daughter would love to try them. I bet she would be thrilled to have a little extra flavor to her favorite school snack! Snyder’s gf pretzels are a go to snack at our house! I had heard of these new flavors but have not seen them in any of my local stores yet. I would love to try the chicken recipe with them! My husband and oldest son are both GF, but our entire house follows the GF diet. I had no idea flavored pretzels are coming! This is o exciting! 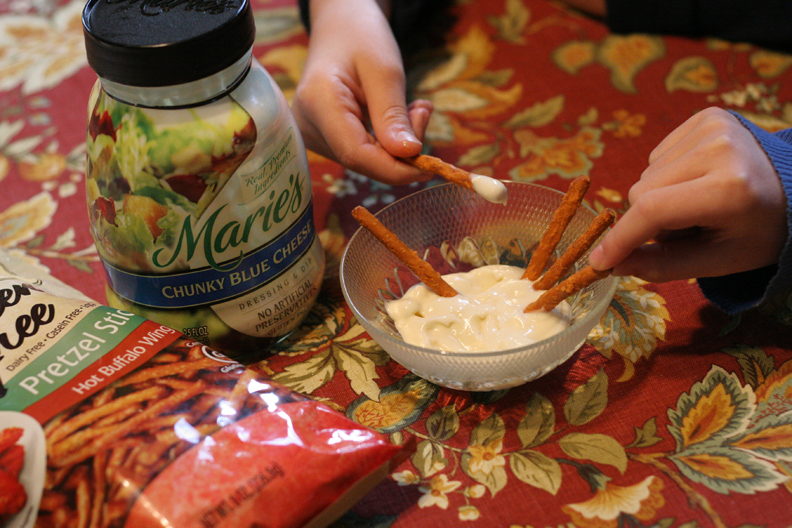 We love pretzels as a snack and Snyders are affordable, which is great. Thanks for this giveaway!! 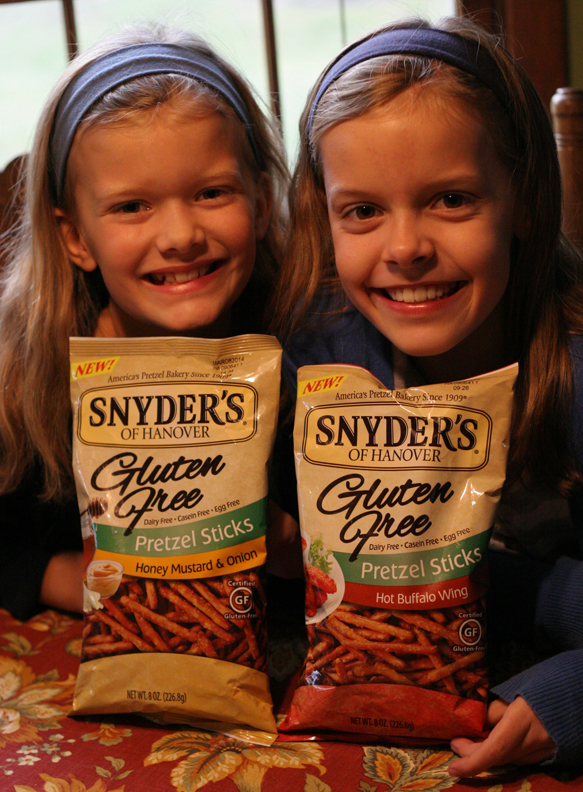 My three children eat gluten free but we all enjoy the Snyder’s Gluten Free pretzels, they are the best. Best of all – they are affordable. Everyone who comes to our home loves them too. We would be thrilled to try new flavors and especially since they are gluten free! Love the original and can’t wait to find the new flavors! I would love to try the honey mustard ones, as I used to eat regular honey mustard pretzels all the time! 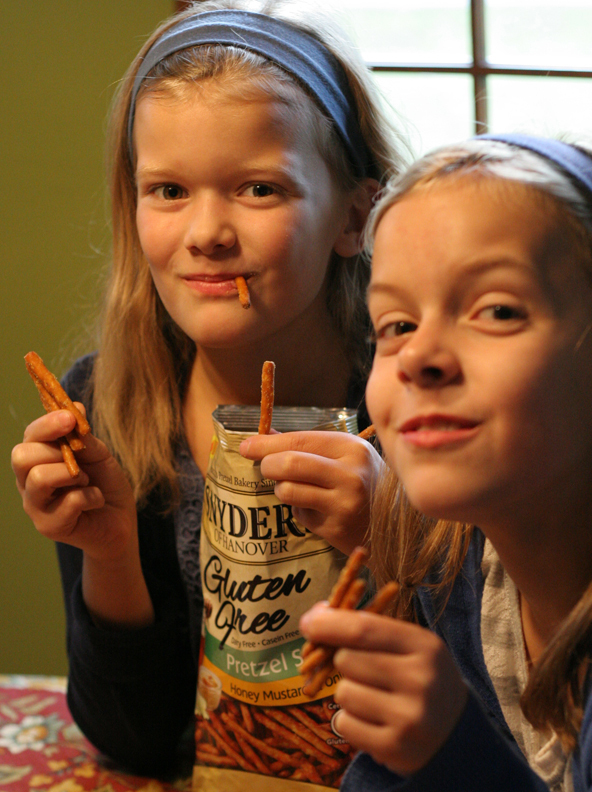 My youngest daughter and I are gluten free and we love the Snyders pretzels. I have been looking but have not found them. I will have to try one if the stores listed because my daughter says she just has to have the Hot Buffalo Wing flavor. I have not seen the new flavors in my local stores yet so I can’t wait to find them and try them out – or better yet – hopefully I will win the prize. (: Thanks for the giveaway! 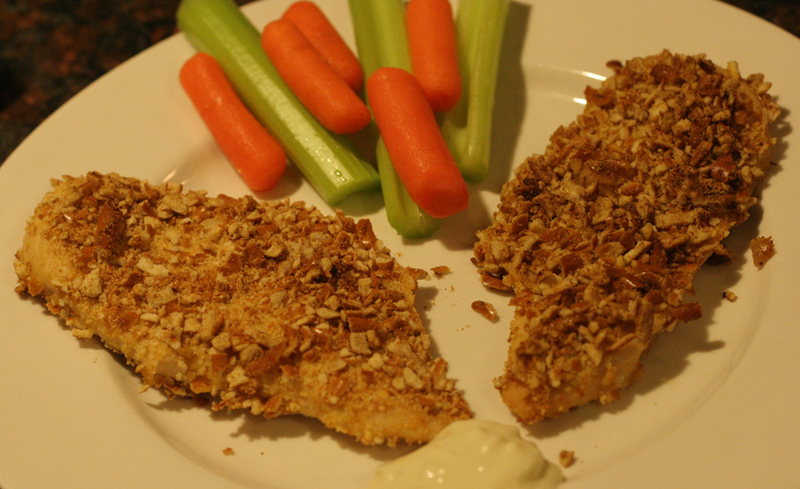 mmmmmm….GF is even better than ‘gluten’ pretzels! I love synder’s gf pretzels! I can’t wait to try the new flavors, I had been hoping for them to come someday! It’s great to hear that there are new flavors! Time for another trip to the store! The Honey Mustard & Onion sounds wonderful. We’d have to dip the Hot Buffalo Wing flavored ones in ranch or sour cream dip too— sounds very spicy! This is so cool, my son loves Snyders pretzels. He loves to put raisons or marshmallows on the end to make a workout bar 🙂 We would Love trying the new flavors, the honey mustard ones sounds amazing.